Japan a fascinating island nation, steeped in tradition and lore, with ancient sites, hallowed temples and natural wonders. The mesmerizing metropolis of Tokyo seamlessly blends ancient tradition with technological wonders. This city of startling beauty offers a mix of world-class shopping, entertainment and dining, as well as exquisite museums, serene gardens and historic temples and palaces. Tokyo offers a seemingly unlimited choice of shopping, entertainment, culture and dining to its visitors. The city's history can be appreciated in districts such as Asakusa, and in many excellent museums, historic temples and gardens. Nestled between the sea and the magnificent Rokko mountain range, Kobe is known as one of the most scenic cities in Japan. This prominent port, anchored by the world's longest suspension bridge, shines today with an ideal blend of ancient cultures and modern attractions. Kobe has been an important port city for many centuries. Its port was among the first to be opened to foreign trade in the 19th century alongside the ports of Yokohama, Nagasaki, Hakodate and Niigata. Nagasaki is the capital and the largest city of Nagasaki Prefecture on the island of Kyushu in Japan. It became a center of Portuguese and other European influence in the 16th through 19th centuries, and the Churches and Christian Sites in Nagasaki have been proposed for inscription on the UNESCO World Heritage List. Part of Nagasaki was home to a major Imperial Japanese Navy base during the First Sino-Japanese War and Russo-Japanese War. Its name means "long cape". Fukuoka is the capital city of Fukuoka Prefecture and is situated on the northern shore of the island of Kyushu in Japan. Ranked 12th of the world's most livable cities in the magazine Monocle in 2013, Fukuoka was praised for its green spaces in a metropolitan setting. It is the most populous city in Kyushu, followed by Kitakyushu. It is the largest city and metropolitan area west of Keihanshin. The city was designated on April 1, 1972. Maizuru is a city located in Kyoto Prefecture, Japan, on an inlet of the Sea of Japan. The city was founded on May 27, 1943. It is a city rich in nature, located on the scenic Maizuru Bay. Maizuru Harbor is located in Maizuru Bay, from which travel to Hokkaidō is possible via the Sea of Japan. Located in the heart of coastal Japan, Toyama welcomes visitors with dramatic scenery, colorful crafts and engaging local sites. This modern capital city is also the gateway to the world-famous Tateyama Kurobe Alpine Route in the Northern Japan Alps. Home to Shomyo Falls, the tallest waterfall in Japan and situated on the coast of the Sea of Japan, Toyama prides itself on the freshness of its seafood and its successful agricultural industries. Be sure to try the city's signature Masu-sushi, made with locally produced rice and seafood from the bay. 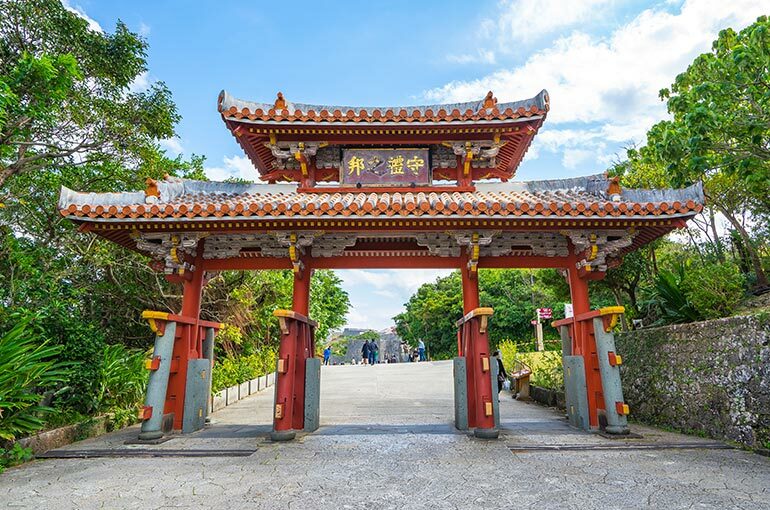 Popular attractions include the Zuiryuji Temple, Soto sect of Zen Buddhism noted for its landscaping and elegant architecture and Masu Sushi Museum where you can see the art of sushi making. Looking for something out of the ordinary? Step inside The Hotaruika (firefly squid) Museum and experience a dedication to this "illuminating" creature of the sea. And visiting Uozu Buried Forest and Mirage Museum is also a good idea. Here, you will learn the history of ancient cedar trees found buried under the Sea of Japan for more than 2000 years and about the mysterious mirage that is seen in the area. Hakodate is Hokkaido's third largest city, located at the island's southern tip. Hakodate is best known for the spectacular views to be enjoyed from Mount Hakodate and its delicious, fresh seafood. Otaru is your gateway to the island of Hokkaido, with treasures such as Hakodate’s famous fish markets, historic Sapporo from Muroran, the endangered red-crested crane nature park in Kushiro and the lush landscapes and abundant marine life of the Shiretoko Peninsula. Otaru is a small harbor city with beautifully preserved canal area and interesting herring mansions. Many old warehouses and former office buildings by shipping and trade companies give Otaru's city center a special character reminiscent of past decades. Until the Meiji Restoration, the area of Aomori prefecture was known as the northern part of Mutsu Province. During the Edo period the Hirosaki clan began building a seaport at the current city of Aomori. There were green woods near the city which were used as landmarks for the ships that came into port. These green woods called aoi-mori is where Aomori got its name. The prefecture came into existence in 1871. The town of Aomori was established in 1889. The town was incorporated as a city in 1898 with a population of 28,000. Overlooking the mighty Pacific Ocean in northern Japan, it should come as no surprise that this "town of mist" is a major Japanese fishing port. But although the freshly caught seafood served ashore is a highlight for many visitors, Kushiro has so much more to offer! Stroll through Kushiro Fisherman's Wharf MOO, where a variety of coastal restaurants and boutiques delight tourists from all over. Or head inland to explore the natural wonders of this region, such as Kushiro Marsh, a lush national park and home to the country's most extensive marshland. Break out your binoculars for close-up views of the rare and graceful Japanese cranes at Tancho Nature Park. And if you're an architecture enthusiast, you'll be fascinated by the unusual structure of the Kushiro City Museum of Art, which resembles the shape of a Japanese crane spreading its wings. Shiretoko National Park covers most of the Shiretoko Peninsula at the northeastern tip of the island of Hokkaidō, Japan. The word "Shiretoko" is derived from an Ainu word "sir etok", meaning "end of the Earth". One of the most remote regions in all of Japan, much of the peninsula is only accessible on foot or by boat. 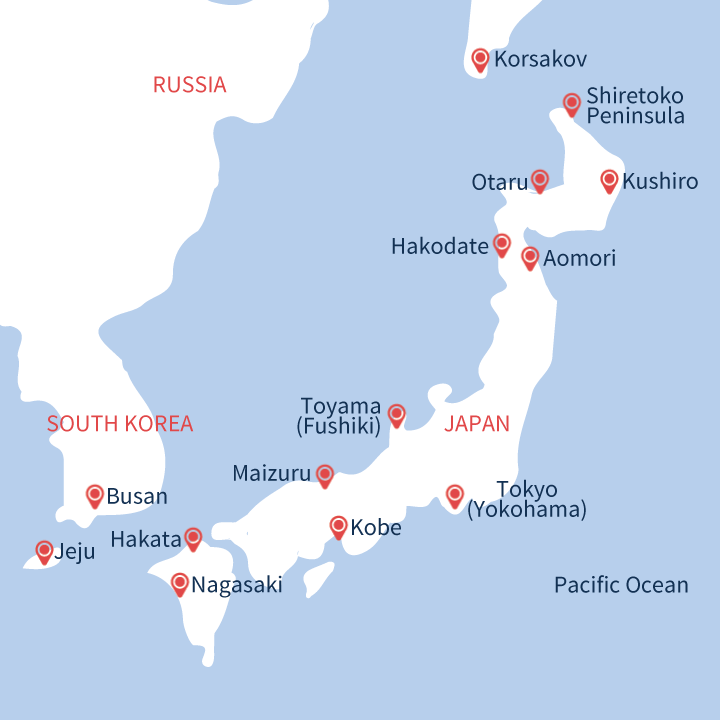 The park is best known as the home of Japan's largest brown bear population and for offering views of Kunashiri Island, ownership of which Japan and Russia dispute. Founded in 1853 as Sakhalin's first Russian military post, Korsakov would later serve as a penal colony. Ruled by Japan between 1905 and 1945, and later reclaimed by the Soviet Union, Korsakov is the place where Japan and Korea left imprint of their sojourn here on Russian culture. Though its tumultuous history includes power struggles and forced labor, the town is the perfect picture of tranquility today. Being the south sea gateway of Sakhalin, Korsakov leads you to Yuzhno-Sakhalinsk, the island's administrative capital and popular tourist destination. Due to Sakhalin's significant natural resources the city is surging with prosperity. Here, you can see a fascinating mix of modern buildings, museums and executive offices sitting comfortably with Russian and Japanese structures. Just off the southern coast of the Korean peninsula lies an idyllic isle that just may remind you of Hawaii. Jeju island (Cheju-do in Korean) is a volcanic island dominated by Halla mountain and replete with spectacular waterfalls, sandy beaches, lava formations, citrus groves and warm tropical water. What more could you ask of Korea's favored destination for honeymooners?